North America Mining Expo is coming to Sudbury, Ontario August 19th and 20th. Sudbury is home to the largest concentration of mining expertise anywhere in Canada and if you ask some people they would say the world. When you get this type of concentrated expertise on display you will be given access to the best and most innovative manufacturers/suppliers/service providers who all have ideas and solutions to your mine related issues. At the tradeshow you will be exposed to an accelerated learning environment that can only takes place on the tradeshow floor. You can expect to gain knowledge and exposure to new technologies, products and resources that are being introduced, find out what others are doing and how your company needs can be addressed right now. At the event you may wish to participate in educational seminars, or any number of networking events that will expose you to new people, new businesses and possibly new ways of thinking about your own operations. Bring your questions and get the answers your company needs today. Oh and yes – have fun. We encourage our onsite viewers to study our list of exhibitors make use of our mobile software bookmark the companies that you wish to see and if you have a specific question ask them or arrange a time that you can meet them at the show. The Big Event is hosted annually in Timmins towards the end of May each year. The show will feature 400 booths highlighting technology from production to processing. Some additonal exciting features of the show include: The Miners Memorial, Conferences, Jack Leg Drilling and this year The Mining Career Awareness Program was added. The show has grown significantly in the past 10 years. He said the mining expo features the latest technology in the mining industry and that in itself will attract more people who want to see what's new in the marketplace. Along with heavy equipment, the show features every conceivable type of supply from boots, to coveralls, to mining cap-lamps, to shovels, to drill bits, to ventilation tubing to explosives. The expo also features a mining related jackleg drilling competition, which seems to be a crowd-pleasing event, although jackleg drilling is not as common in modern mining as it once was. 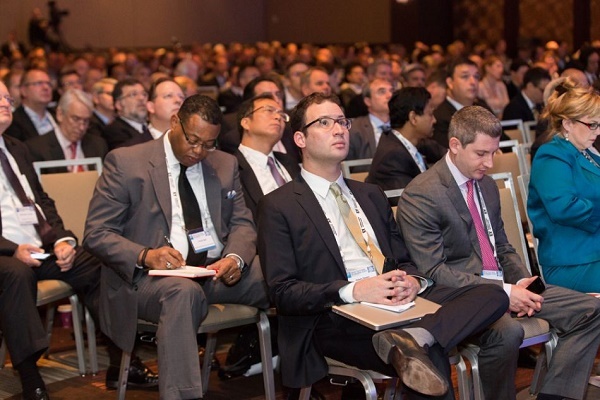 The annual CRU Ryan’s Notes Ferroalloys conference is the largest in North America for a reason. Everything is orchestrated to cater to over 650 delegates intent on conducting business. 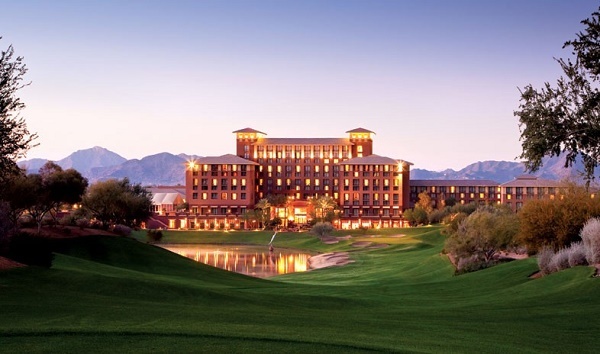 The annual CRU Ryan’s Notes Ferroalloys conference will take place on the 18-20 October in Scottsdale, Arizona. With over 650 delegates expected to attend, the event provides an excellent opportunity to meet, plan and negotiate business for the coming year. The event offers many organised networking functions including; evening receptions, coffee breaks, lunches, golf matches, tennis tournaments and excursions. The conference programme also provides an opportunity to benefit your business and will feature expert speakers offering economic, geo-political and commodity specific analysis. The Phosphates conference brings together experts and decision makers from the leading companies within the fertilizer, industrial and feed phosphate industries to network with other organisations that define phosphate supply and demand. Since 2013, the Phosphates conference has been held annually. Phosphates 2014, the 8th in the series, will be held at the Marriott Tampa Waterside Hotel, Florida on 23-25 March 2015. Don't miss this essential industry event - providing producers, traders, consumers and technology/equipment providers with an annual meeting point to network, set up contracts and share industry knowledge. RU is delighted to announce details of the 22nd North American AluminumTrends Conference on the 8-10 March. Following many years of hosting the event in Miami we have decided to host 2015 at the Wild Dunes Resort in Charleston. This well established conference will once again attract leading industry experts and CRU’s respected analysts to tackle the most challenging issues facing the industry. The event has provided a reliable annual source of market and price information for long term planning and for short term risk management purposes for over 22 years. This year’s meeting will be held in South Carolina for the first time, a fitting location due to its importance in the smelting, rolling and consumption of aluminium in the US. Join us next spring for concise analysis on short term market and price trends and longer term views on supply and demand. • Will the increasing amount of surplus power in North America lead to new smelting capacity? • Is the market being manipulated? • What is the outlook for premiums? • Will the stocks time bomb blow up? • Exploring availability projections for can stock. Will autobody sheet conversion trends gather pace? • Substitution: Could steel or composites ruin the party? • By how much is China’s economic growth slowing – how big is the risk for aluminum demand? • Will the dollar continue to strengthen and what would the impact on the North American Aluminum Industry be? • What is the outlook for scrap – will there be enough to go around? CRU Ryan’s Notes is delighted to announce details of the Metallics Meeting on the 26-27 Januaryat the Conrad Hotel, Miami. Now in its 8th year this well established event attracts over 125 executives representing companies active in the North American, Turkish, Russian, European and South American metallics markets. The influence and geographical reach of our delegates provides excellent networking and supports new business opportunities. The commerce of scrap, DRI and pig iron is international, interrelated and constantly evolving. The event provides an excellent source of information on price and the impact of market trends. Hosting the event at the beginning of the year provides the opportunity to understand the trajectory of 2015 and refine business strategy. For nearly 32 years the Conference was sponsored predominantly by the non-profit University of Texas at Austin (UTA), Health and Training Center, which provided numerous planning, budgeting, registration, and management services for the Conference through federal States Grants subsidies. In 2014, when UTA was unable to continue providing extensive support to the Conference due to federal budget cuts, veteran members of the Conference Committee formed an independent non-profit entity, the SCJMHSC Association, to continue the annual Conference. The SCJMHSC Association is governed by an elected Board of Directors, and is assisted by the Conference Planning Committee. Members of the Planning Committee are volunteers from the entire spectrum of the mining community. Board members receive no remuneration whatever for their services. The SCJMHSC Association is legally established under the laws of Texas, and has filed an application with the IRS for tax-exempt status, which will enable sponsors to claim their donations as tax-deductible (charitable) gifts. 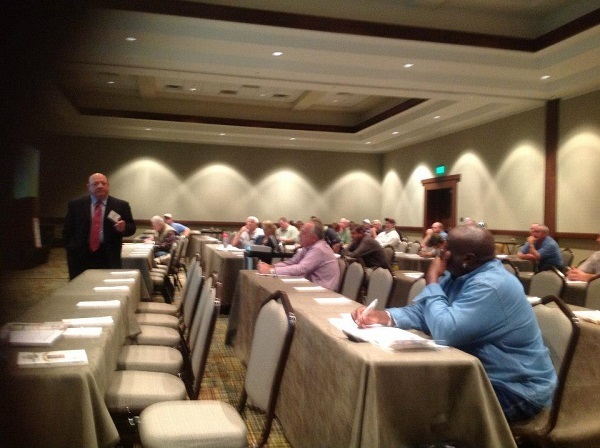 The Industrial Minerals Association – North America (IMA-NA) is excited to announce that the 2015 IMA-NA Technology Workshop will be held on March 9 – 11, 2015 in Orlando, FL at the Buena Vista Palace Hotel & Spa. The Workshop will feature a strong lineup of topics and speakers on topics impacting the industrial minerals industry in the areas of safety, health, environment, operations and engineering. We have arranged a special room rate of $132.00 per night (all resort fees, wireless internet service, etc… are included). Are you interested in safety and health? Are you employed in the mining, construction or allied industries? If you answered yes, mark your calendar for the 12th Annual Florida Industry and Mining Safety, Health and Environmental Conference. Our theme this year is “GET ON BOARD WITH SAFETY!” Each year, we bring keynote speakers and presenters who are experienced, well-known safety professionals – experts in their field. If you only attend one educational conference in 2015, this is the one for you. In addition to excellent educational sessions, ample time is built into the schedule to allow you to visit with industry exhibitors and network with familiar colleagues and also meet new ones. The Missouri Mine Safety and Health Conference is a forum to provide a broad spectrum of information, attitudes, and approaches for improving the health, as well as safety, of all who enter or work in mines and quarries. Every year top speakers from around the country combined with the experiences shared between the participants from all industry areas make the MMSHC an engaging experience. The next conference is scheduled for January 15th and 16th, 2015. The Missouri Mine Safety and Health Conference Committee is an independent, non profit, industry organization. These volunteers are comprised of top industry professionals. Members are safety profressionals from different mining entities, MSHA officials, Missouri Department of Labor (Director, Division of Mines), Missouri Limestone Producers Association (Executive Director), and executives from varied service, equipment, supply, and support companies. All committee members have extensive experience, daily involvement, and intense interest in safe and healthy mining operations. Click the link to see the complete list of the MMSHC Committee Members. SOUTH-TEC draws manufacturing suppliers, distributors and equipment builders from across North America and around the world – bringing them together in Charlotte, North Carolina. With more than 200 exhibitors, attendees can find all the latest technologies and services – plus the experts who built them – ready to demonstrate solutions that can help them grow their business. Visitors can make side-by-side comparisons, discover integrated equipment, hear about industry trends and forecasts, and leverage their purchasing power. SOUTH-TEC is the single best source to discover the future of manufacturing! 2015. Only WESTEC brings you the very latest technologies – from software, cutting tools to multi-tasking machines – all from top international equipment manufacturers. Learn from fellow attendees how WESTEC can help your company cut costs, enhance quality, or earn a place on an OEM’s preferred supplier list. WESTEC is where collaboration starts – a place to network, form relationships, build partnerships, and solve your firm’s most pressing problems. If these are your company’s goals, WESTEC is where you need to be! Plan now to participate in WESTEC. Attend and get the most out of your visit by bringing your company team. Exhibit to connect directly with customers and showcase your products. Sponsor and get maximum exposure for your brand and company. The Uranium Recovery Workshop will provide an opportunity for representatives from NMA, U.S. Nuclear Regulatory Commission (NRC), U.S. Department of Energy (DOE), uranium recovery licensees and other stakeholders to meet and communicate directly regarding uranium recovery technical and regulatory process issues. This information-packed workshop will feature current issues affecting the uranium recovery industry and will focus on enhancing and promoting a better understanding of regulatory trends and the uranium recovery licensing program. Even as much as the world has become available for exploration over the past decade, miners continue to return to Nevada. Why? Political stability, transparent regulatory environment, good infrastructure and GREAT GEOLOGICAL POTENTIAL. 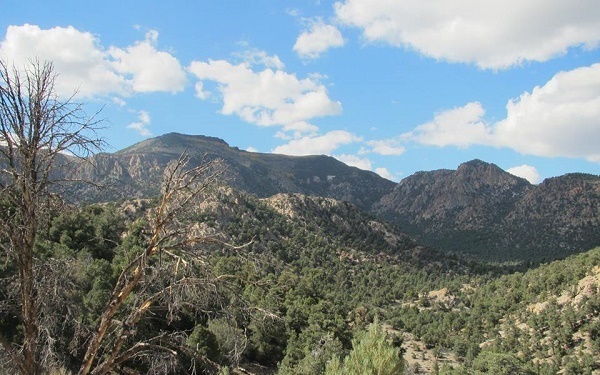 Miners return to focus on Nevada’s geology and its important mineral deposit types: Carlin, epithermal and intrusion-related gold and silver, as well as other deposit types (porphyry Cu and Mo, IOCG and industrial materials) are also rising in importance. 2) How to vector into an economic deposit? The 2015 symposium theme, NEW CONCEPTS AND DISCOVERIES, emphasizes both the major deposit types and trends that have sustained the mining industry for several decades as well as other deposit types and areas that may eventually have greater influence. The focus of this meeting is exposing the attendees to new ideas that we use to find new deposits: case studies, descriptions of new (or recently reinvigorated) deposits and targets, framework geology, tectonics and metallogeny, and the latest deposit concepts and exploration technologies. As with previous symposia, the meeting will include talks, poster and drill core presentations, numerous exhibitors, and pre- and post-meeting field trips and short courses, culminating with the popular follow-up volumes. It will be organized into morning plenary (single session) talks and afternoon concurrent sessions with an emphasis on discussion. It will be preceded on May 17 by a special joint GSN-SEG forum entitled “Carlin-like Gold Deposits: What Can We Learn Beyond the Known Trends and Nevada?” The format of this session will be modeled after the popular GSN-SEG forum “Controversies on the Origin of World-Class Gold Deposits: Carlin and Witwatersrand, which was held prior to GSN’s 2005 symposium. We invite you to join us, and more importantly to participate! Contact us if you want to contribute a paper, talk or poster, or if you have ideas about talks you would like to hear or topics to be explored. This symposium is the paramount venue for geochemists from around the world to come together and share technology and experiences. The focus will be on Applied Geochemistry for: Exploration, Environmental Technologies, and Sample/Data Analysis. A comprehensive program is planned with multiple keynote speakers, parallel technical sessions, one-day short courses, pre-symposium field trips, poster sessions, exhibitors, and social programs (including partner programs). Tucson Arizona is an ideal location to hold the 27th IAGS with great weather in the spring, easy access for visitors, abundant potential for field trips & visitor recreation, plus a world class resort with convention center perfectly suited for the IAGS. The venue has offered a special room rate to our group for this event of $169 reduced from the standard rate of $215. Additionally there are a number of "casitas" that provide great space for families or those who wish to share space, but not a room. Several of these casitas are ideally suited for companies wishing to have evening social/marketing events. The IAGS will consist of strong technical content including: 5 field trips (pre-symposium), 4 one-day (possibly two-day) short courses, and 7 key-note speakers, plus 11 technical sessions for a total of 88 speakers. In addition there will be space for twenty-five (25) 8x10 booths for exhibitors and up to 100 posters at a time in the morning/afternoon break areas. There will be plenty of planned social events including: Sunday Ice-Breaker, Tuesday evening Distinguished Lecturer, Wednesday (all day) Social/Field Trips (designed for attendees and accompanying persons), Thursday evening AAG Awards Dinner, and partner events throughout the week. Time has been set aside for AAG Executive/Council meetings and the AAG Annual Meeting during the IAGS week. The western United States has a rich mining history with many of the geochemical techniques and processes used today being developed and/or proven at mines throughout the region. From gold and silver in Colorado, Nevada, Idaho, and California to copper in Montana, Utah, New Mexico, and Arizona the mineral wealth of this area has powered the growth and industrialization of this nation. Additionally, there has been production of uranium, coal, natural gas, oil, and rare earths (REE) throughout the region. Manufacturing is experiencing a tremendous expansion of growth and innovation. HOUSTEX 2015 provides the means to fuel and strengthen that expansion. HOUSTEX 2015 is an immersive experience, featuring hundreds of exhibitors highlighting the latest manufacturing technologies, and new interactive opportunities. Attendees will enjoy scores of new product demonstrations, hear experts share insights on industry trends, and make connections that can take their company to the next level. 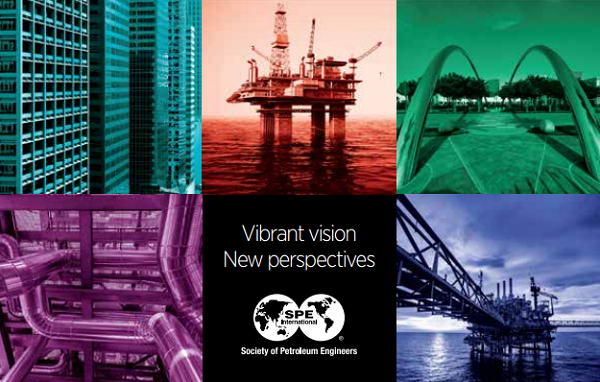 the Society of Petroleum Engineers’ Annual Technical Conference and Exhibition (ATCE) since the first edition 90 years ago. for everyone from seasoned professionals including executives, engineers, managers, and scientists to students and young professionals. AMCAA - America's Conference on Al Alloys held in conjunction with COM 2015 will be held in Toronto, Canada from August 23-26th, 2015 at the famous Royal York Hotel in downtown Toronto will be the first time this conference is being held and is a complementary scientific meeting to the highly regarded “International Conference on Aluminium Alloys (ICAA)” series of conferences. AMCAA 2015 will provide a platform for academic and industrial researchers, scientists and engineers to present and discuss recent developments and progress in the application of aluminum alloys to the transportation sector. 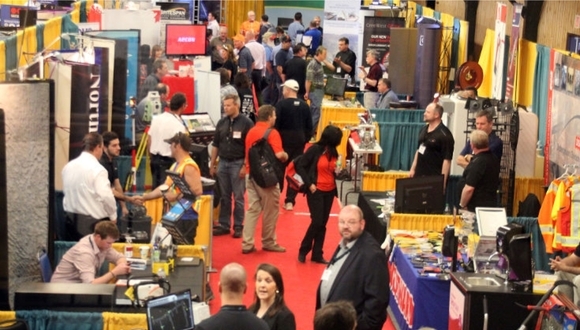 After more than 20 years of serving the industry, the Longwall USA biennial exhibition and conference has become the largest longwall equipment trade show held in North America. 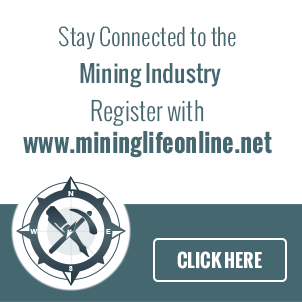 Focused expressly on underground and longwall mining, the 2015 event will bring a growing list of domestic and international exhibitors and sponsors to showcase the latest in technology and techniques for show participants. 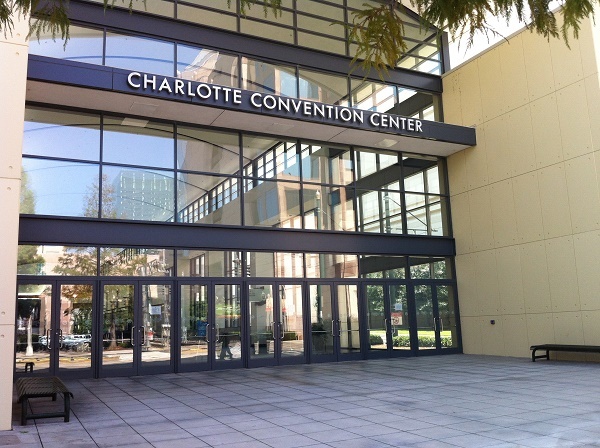 The University of North Carolina at Charlotte invites you to join us June 8 - 12, 2015 for the 43rd SME North American Manufacturing Research Conference (NAMRC) and the ASME Manufacturing Science and Engineering Conference (MSEC 2015), the premier international forum for applied research and industrial applications in manufacturing and design. Charlotte, North Carolina is the largest city in North Carolina and has long been known as a center for banking and finance, but is fast becoming the center for manufacturing activity in the state. It is the home of some of the largest companies in the energy sector and is becoming the "Energy Hub" of the U.S. The UNC Charlotte main campus is located about 10 miles northeast of the city center. The 2015 conference schedule will include keynote and technical presentations, expert panels, student poster presentations, an exhibition of industry partners, an early career forum, UNC Charlotte lab tours, an awards banquet, luncheons and more. Registration, conference details, and lodging information will follow soon. Bookmark this website as more information will be added as details are confirmed. Don’t forget to put June 8 - 12 on your calendar now to make plans to visit Charlotte in 2015. Celebrating 30 years in 2015, Steel Success Strategies in New York continues to be THE premier event in the steel industry calendar. Featuring presentations in 2014 from top level executives including Lakshmi N. Mittal and John Ferriola, this event provides unrivalled networking opportunities and is the must-attend event of the year. RETC is an international forum for the exchange and dissemination of developments and advances in underground construction. RETC is known for timely, quality programming. Issues covered in the program provide innovative solutions to the unique challenges associated with the tunneling industry. Increase efficiency. Reduce lead times. Improve margins. Attend THE BIG M and connect with the people, technologies, and solutions you need to accelerate your business and stay ahead of the competition. • M | Exhibits – The latest ideas, innovations, and technologies from across the manufacturing industry. See, touch, and experience what’s next in manufacturing from exhibitors. • M | Factories – Dynamic and immersive technology experiences on the M | Exhibits floor. Modeling, Simulation & Visualization (MSV) and Automation will be featured. • M | Conference – Manufacturing’s heavy hitters share how they’re achieving success and transforming manufacturing. • M | Exchange – Meet experts in additive manufacturing and advanced materials, engage with students, and discover resources to support your business. The Minerals North Conference brings the mineral industry together with a broad spectrum of people and businesses in Northern BC. 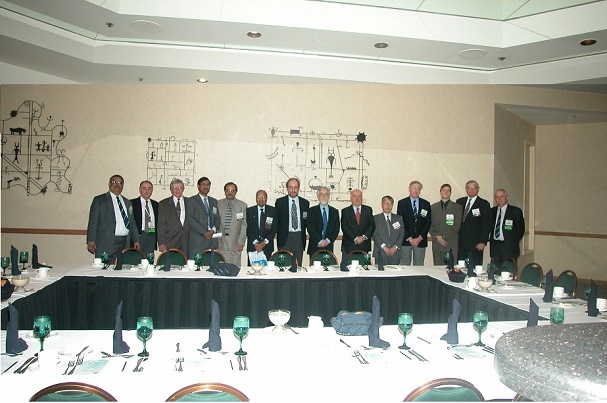 37th International Symposium on the APPLICATION OF COMPUTERS AND OPERATIONS RESEARCH IN THE MINERAL INDUSTRY (APCOM 2015) is taking place on May 23rd - 27th, 2015, at Westmark Fairbanks Hotel & Conference Center, Fairbanks, AK. The College of Engineering and Mines, University of Alaska Fairbanks and the Society for Mining, Metallurgy and Exploration, Inc. (SME), announce with pleasure the 37th International Symposium on Application of Computers and Operations Research in the Mineral Industry (APCOM 2015) to be held in Fairbanks, Alaska, from May 23rd through May 27th, 2015. The focus of the 37th APCOM is to further the APCOM goal of contributing to effective decision-making processes throughout the entire mineral industry. The technical program of this symposium would be a balanced of traditional areas of exploration, including geostatistics, mine design, production planning, investment analysis, artificial intelligence simulation, mine automation, rock mechanics, mineral processing, and data management systems. All are designed to facilitate and promote application of computers and operations research in the mineral industry. The RAPID Exposition is a visual, creativity-inspiring, hands-on learning playground. The RAPID show floor offers a variety of solutions for additive manufacturing, 3D printing, 3D imaging/scanning, DDM, and rapid prototyping. It will include OEMs, service bureaus, and related technology consultants and partners – the vendors your business needs to know to advance in the additive manufacturing industry. RAPID is known worldwide as the preeminent event for 3D printing, scanning, and additive manufacturing. We will be celebrating our 25th anniversary as the ultimate authority in 2015, with the most comprehensive display of 3D technology, expertise, and innovation ever showcased in one place. The level of cutting-edge 3D innovation at RAPID is unparalleled, as well as the breadth and depth of additive expertise across all industries. This is an extraordinary opportunity to experience the newest 3D products and do a side-by-side comparison with other products to find your best fit. This is your event to explore the unlimited possibilities of how 3D technology can advance your business. Haulage & Loading 2015 offers a focused, intimate conference and exhibition that brings attendees the latest in technology to help their operations increase efficiency, operate safely, and maximize profits. The conference focuses on real-world solutions and experiencesthe kind of information you'll use daily. To envision a new product, it takes human ingenuity. To bring it to life, only manufacturing brilliance will do. Which is why so many manufacturers on the East Coast – local job shops, mid-level enterprises and multinational OEMs – attend EASTEC. It’s the best place to keep their operations current with the latest technologies and management strategies. East Coast manufacturers come to EASTEC looking for top suppliers and new partners. Meet a motivated audience, ready to evaluate and make purchases that keep them competitive. See what makes EASTEC the most important event of 2015, giving you the best return on your investment. We are pleased to announce that May 3-9, 2015 is BC Mining Week. Mining is one of BC’s largest and oldest industries and BC Mining Week is an opportunity to recognize and celebrate the importance of the modern industry to British Columbians. Activities are planned for Vancouver and communities around the province. We invite you to participate in the celebration! Coal Prep is the ONLY annual trade show and conference in theU.S. dedicated to coal preparation and processing. 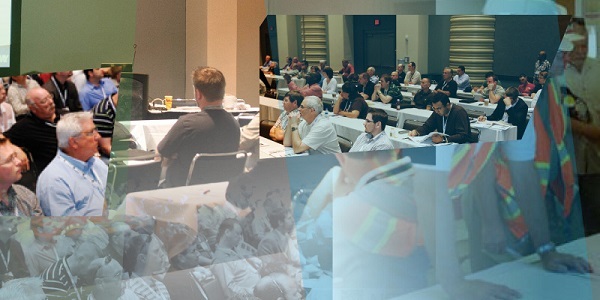 Industry professionals come from all over the world to share the latest ideas and most effective techniques on coal preparation and processing plant technologies. These professionals come to purchase and preview the latest equipment and services in order to increase plant productivity and reduce costs. AGG1 Aggregates Academy & Expo is the aggregates industry’s leading exposition and education resource. AGG1 features in-depth industry-focused educational programming and comprehensive exhibits that showcase the latest technologies and innovations in aggregates-related equipment, products and services. The AGG1 exposition features a wide range of aggregate-related equipment, products and services, with exhibits that incorporate demonstrations and technology. AGG1 features a New Products & Technology Program as another way for attendees to quickly find new and innovative products and services on the show floor. The AGG1 Academy is the one place to go to learn about virtually every aspect of the aggregates industry. The practical knowledge you’ll gain and proven techniques you’ll learn about will enable you to manage your operation more effectively, efficiently and profitably. The 8th AMM Steel Tube and Pipe conference will be a particularly important one this year as the dust settles from the trade case that ruled in favor of domestic producers. the US market a healthy boost . Meanwhile the drop in oil price will feed through to the industry and is creating uncertainty for North America and beyond. This is IECA's premier educational event for the erosion, sediment control and stormwater industry. Environmental Connection combines intense, full and half day training courses with topic-focused technical sessions and the largest expo of its kind. Environmental Connection 2015 will be a co-located event with the Industrial Fabrics Association International's Geosynthetics 2015. Attendees will have access to both associations' educational offerings regardless of which conference they register for (this includes morning plenary, technical sessions and panel discussions), plus one giant exhibition - all under one roof. On-site registration will be conducted during the Registration hours noted above in the Convention Center. 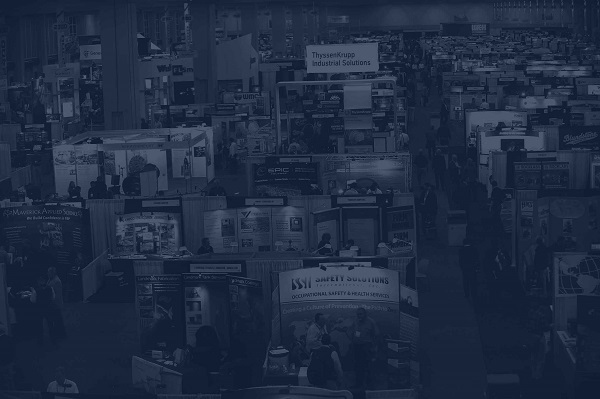 Exhibitor products and services will be showcased at the 2015 SME/CMA Annual Conference at the Colorado Convention Center. Badges are required for admittance. All food and beverage functions held each day in the Expo Hall will be located in the SME Conference Café, Lounge and two Restaurants. Field trips are subject to cancellation based on limited attendance. Make your reservations early using the registration form. More info. The SME Bookstore will be located in the Colorado Convention Center. It will feature SME publications and a large selection of merchandise. You can also pick up your copy of the preprint thumb drive of the 2015 SME/CMA Annual Conference by redeeming the ticket enclosed in your onsite registration packet. Each full, one-day and student registrant will receive a thumb drive of preprints from the 2015 SME/CMA Annual Conference. Additional thumb drives are available for purchase. See registration form in this mailer. These will be available for pickup in the SME Bookstore during the conference (offer excludes discounted and exhibits-only registrations). 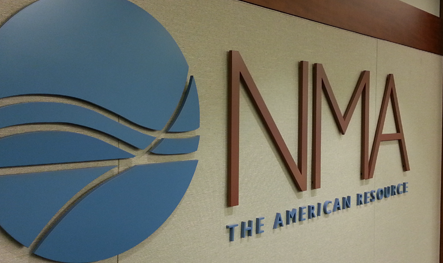 SME Short Courses will be conducted at the Colorado Convention Center. More info. 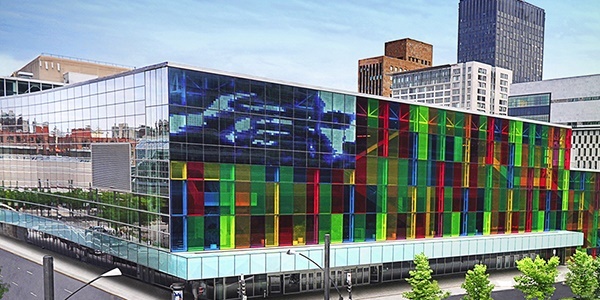 All technical sessions will be conducted at the Colorado Convention Center. More info. The SME Conference Café will be located in the center of the expo hall at the Colorado Convention Center. It will be a convenient meeting and gathering spot for SME members and attendees for networking; relaxing, retrieving emails, and accessing charging stations to recharge your mobile devices. The café will have copies of the most recent SME magazines. Attendees will learn about the seven SME Divisions and can see a demonstration of the breadth and depth of the online global mining and minerals resources on OneMine.org. SME photo contest winners will also be on display. 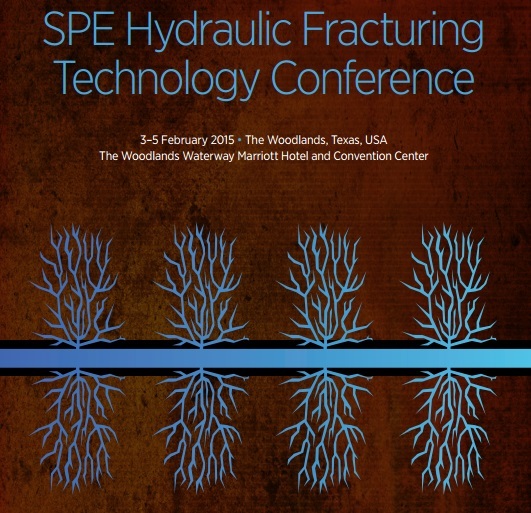 The SPE Hydraulic Fracturing Technology Conference is a critically important event for our industry and one of SPE’s most popular events. With a dynamic mix of sessions that feature unconventional resources technologies and hydraulic fracturing demonstrations and rigs, this event is not to be missed. We are the largest individual-member organization serving managers, engineers, scientists, and other professionals worldwide in the upstream segment of the oil and gas industry. AMM’s 20th Mexican Steel Conference returns to Cancun in January 2015. The event has long been established as the meeting place for steel executives from across North and Latin America. 2014 has brought a huge amount of change to the industry so it’s more important than ever to keep up to date with the latest trends in Mexico, connect with clients, and make new contacts. This year DeAcero and ArcelorMittal Mexico share their views on the market. They are joined by delegates from leading Mexican, US and South American steel producers. The 47th Annual Canadian Mineral Processors Conference will be held in Ottawa at the Westin Hotel January 20 to 22, 2015 in the Confederation Ballrooms (4th Floor). The conference will feature presentations on various aspects of mineral processing including comminution, flotation, gold and iron ore processing, mineralogy, mill optimization, process control and projects. A special rate of $201 (standard/premium) and $251(deluxe) which includes complementary internet has been negotiated at the Westin Hotel (reference the Canadian Mineral Processors Conference). 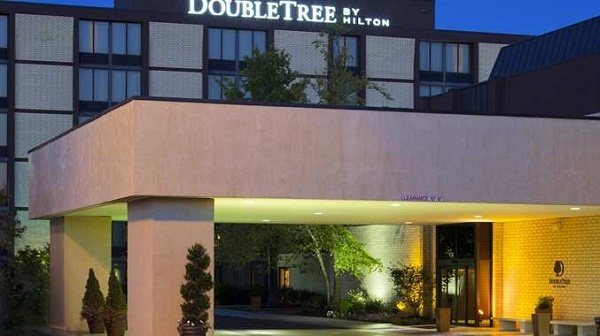 The Westin Hotel will only guarantee these rooms until December 13, 2014. Last year our block of rooms sold out in early December so please book your room early to avoid disappointment. Phone (613) 560-7000 (FAX (613) 560-2707) for room reservations. The early registration fee for this year's meeting is $600 for CIM/AIME/TMS members, $811.31 for non-members (tax included). The non-member rate includes one-year membership in CIM. Registration includes the three day meeting, coffee breaks, the Tuesday and Wednesday luncheons and evening social receptions, the Wednesday reception and awards banquet, as well as a copy of the proceedings. All pre-registered delegates will be able to pick up their registration kits at the Conference Registration Desk, 4th Floor, Westin Hotel, Monday evening between 19:00 and 22:00 and during the conference each day between 7:00 to 15:00 (Tuesday to Thursday). New registrations will be taken during these times. Note: To pre-register, the form must be received by December 17, 2014 and any requests for refunds must be made, in writing, prior to December 17, 2014. After this date an administration fee of $100 will be charged for new and/or cancelled registrations. Five short courses will be offered at CMP 2015. All costs include lunch, coffee breaks and course materials. Attendance is limited, please register early. 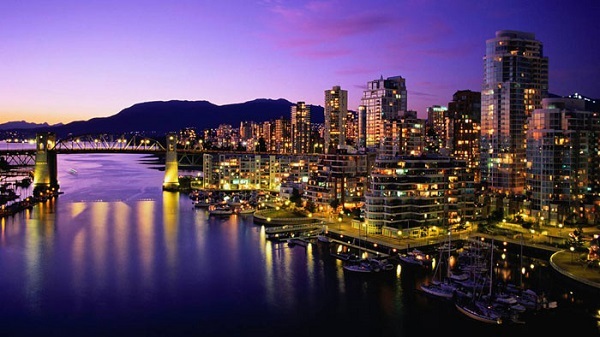 The Vancouver Resource Investment Conference is the world's largest resource investment conference dedicated on resource exploration and the largest of all annual trade shows held in Vancouver, Canada. Hear from investment thought leaders and wealth influencers. Speak one-on-one with executive members from companies covering every corner of the mineral exploration sector along with metals dealers, oil & gas, renewable energy, media and financial services companies. This is a must-see for investors and stakeholders in the global mining industry. This course offers an introduction to Austrian economics, focusing on its applications to the financial markets. To this end, the bulk of the course will address Austrian business cycle theory and how it can be used to evaluate and forecast price trends in the stock, bond, commodity, and currency markets. An overriding theme of the course is the importance of central bank policies in perpetrating bull and bear market cycles. Attendees will receive 1 hour of Institute accredited CE. An alternative view of price determination in commodity markets based on free market economics. The class will engage in a detailed assessment of what constitutes supply and demand, and how interaction between the two establish market prices. These theoretical fundamentals will be supported with real-world data, and applied to commonly discussed global marketplace dynamics and price influences such as emerging markets economic growth, Chinese commodity consumption, central bank monetary policies, currency movements, and the “financialization” of commodities. Attendees will receive 1 hour of Institute accredited CE. The Cantech Investment Conference will bring together the top thought leaders, fastest growing companies and most influential investors in the country for a full day exposition at the Metro Toronto Convention Centre. 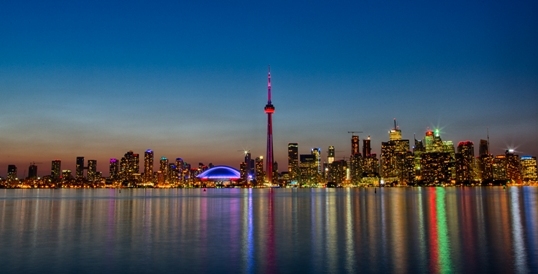 This is the ultimate showcase for Canadian technology development and investor opportunities. Cambridge House International, the worlds leader in Venture Capital Investment Conferences has partnered with CantechLetter.com, Canada's most respected intelligence service focused on Canadian technology trends, developments and forecasts to bring together the country's first, industry wide, technology investment opportunities conference. Pre- register online for $40 or pay $60 at the door. Heap leaching is a complex process that requires the integration of many aspects to establish an economically viable and technically sound project, both during operation and closure. Many other conferences focus on specific scientific and engineering aspects of heap leaching, or have heap leaching as a subtopic. Heap Leach 2015 is the third conference in this series of conferences that brings it all together so that a wide range of professionals can share their expertise and experience in the development, operation and closure of heap leach projects. This conference will include the planning, design, operation, closure, and research aspects of heap leaching. The Prospectors & Developers Association of Canada (PDAC) represents the interests of the Canadian mineral exploration and development industry. The association was established in 1932 in response to a proposed government regulation that threatened the livelihood of Ontario prospectors. A timeline of the association's history is available here, along with a written history that can be found here. Today, 82 years after its founding, the association is a national organization with more than 9,000 individual members (including prospectors, developers, geoscientists, consultants, mining executives, and students, as well as those involved in the drilling, financial, investment, legal and other support fields) and more than 1,200 corporate members (including senior, mid-size and junior mining companies and organizations providing services to the mineral industry). The association’s activities and the services it provides fall generally into three categories: advocacy, information, and networking. The association is best known for its annual convention, trade show, and investors exchange. In 2014, this event attracted 25,122 attendees from 103 countries. The work of the association is carried out by a 48-member Board of Directors, 18 active committees; and a permanent staff. In 2012, the Board of Directors approved a five-year strategic plan for the association. This blueprint identified three priority areas on which the association will be focusing much of its resources and efforts: access to land, Aboriginal affairs and access to capital. Considerable effort and resources will also be allocated to corporate social responsibility (CSR), human resources, student initiatives, communications and public affairs, as well as heightening our ability to host the world-renowned PDAC Convention. Members are kept up-to-date on PDAC activities and industry matters through PDAC's Core magazine, published three times a year; PDAC eNews, a monthly emailed newsletter; PDAC's Annual Report, an annual summary of the work of the association; and other occasional publications. 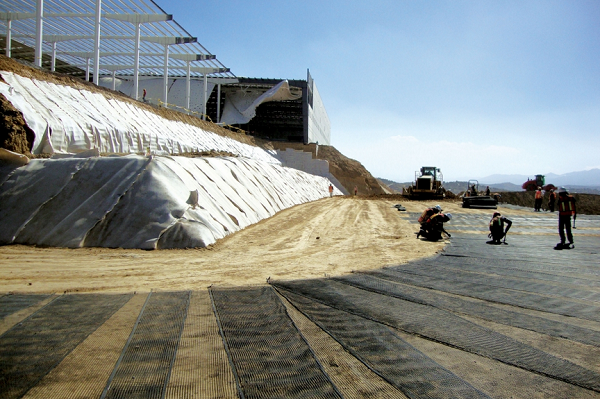 Geosynthetics 2015 is a must-attend trade show for geotechnical, civil and geo-environmental communities. 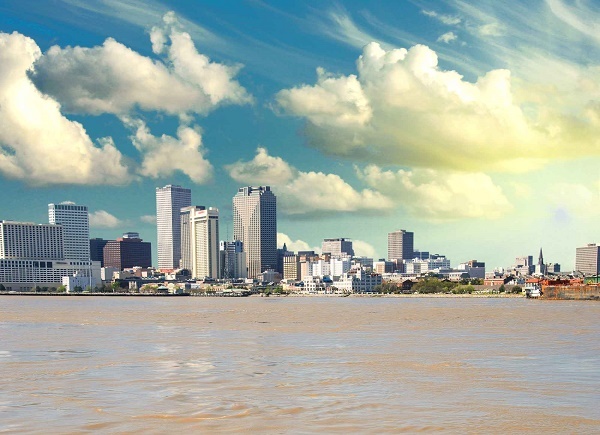 Co-located with the International Erosion Control Association Environmental Connection Conference, this is where the industry unites to share developments in geosynthetics engineering and technologies. The four-day event features more than 225 exhibits, plus a comprehensive program of short courses, panel discussions, training workshops, and technical papers presented by top industry experts. Buyers and sellers make qualified connections on the trade show floor and at receptions, luncheons and other valuable networking events. Geosynthetics 2015 is organized by the Industrial Fabrics Association International and the Geosynthetic Materials Association, and is supported by the North American Geosynthetics Society under the auspices of the International Geosynthetics Society. Exhibiting and sponsorship opportunities are available to companies that market geotechnical products and services. Whether you attend or exhibit, we want you to get the most out of your trade show experience. Co-sponsored by International Society of Explosives Engineers; Ohio Aggregates & Industrial Minerals Association; and Ohio Coal Association. Endorsed by Ohio Department of Natural Resources. Join nearly 1,600 blasters, manufacturers, government officials and industry leaders at the world’s largest conference on explosives engineering, sponsored by the International Society of Explosives Engineers. Highlights include an industry panel discussion, a student industry connection and more than 90 technical papers scheduled for presentation. Four days packed full of fundraisers, special events and tours for attendees and spouses. Special events for international members that foster networking and new industry connections. More than 130 exhibits showcasing the latest products from some of the biggest companies in the explosives industry. This has been a remarkable year for growth and change in Western and Northern Canada’s natural resource sector. The continuous expansion of development projects combined with the rapidly changing regulatory system has created an uncertain future for this industry and the Aboriginal community. Through this process of change, it is necessary for key stakeholders to come together to advance ideas and develop creative solutions to the various challenges this industry faces. Building on the success of past programs, this year’s Insight Information event will focus on developing strategies for building capacity in Aboriginal communities to advance the natural resource industry in an economically and environmentally sustainable way. Through workshops, case studies, panel discussions, and social meetings, the participants of this forum will learn new legislative and legal changes that affect each stakeholder; how to promote corporate social and environmental responsibility; how to advance Aboriginal owned enterprises; and how to build partnerships between Aboriginal communities and private firms. This is a unique opportunity to meet representatives from the Aboriginal community, natural resources industry, government, and other key stakeholders to discuss practical steps that address issues in the energy resource sector of Western and Northern Canada. We are sure you will not want to miss this valuable opportunity to exchange practical and strategic insights. Mine Closure has become an internationally recognized conference series since it was established in 2006. The 10th International Conference on Mine Closure will offer a multidisciplinary global forum for exchanging views and developing capacity, to ensure that new mines are designed with closure in mind, and old sites are closed economically, while minimizing environmental and societal impacts. This is the second time Mine Closure returns to Canada, after a very successful conference in 2011 at Lake Louise that attracted almost 600 delegates. Following on that success, the conference organizers have again partnered with the British Columbia Technical and Research Committee on Reclamation (BC TRCR). Mine Closure 2015 will be held in conjunction with TRCR’s 39th Annual BC Mine Reclamation Symposium. The joint event will offer delegates a stellar technical program featuring the latest scientific developments, as well as insightful discussions on the most pressing issues. The Canadian Investor Conference, previously the World Resource Investment Conference will be held at the Vancouver Convention Centre West. Three industries will come together for this 2-day event to cover RESOURCE, TECHNOLOGY and DIVERSIFIED investment opportunities. Companies in Mineral Exploration, Oil & Gas, LNG, Agriculture, Life Sciences, Energy Metals, Technology and Real Estate will exhibit. Top industry analysts, newsletter writers, c-suite executives, hedge fund managers, trends forecasters and finance celebrities will cover speculative and direct investments and strategies, economic outlook and macro trends. 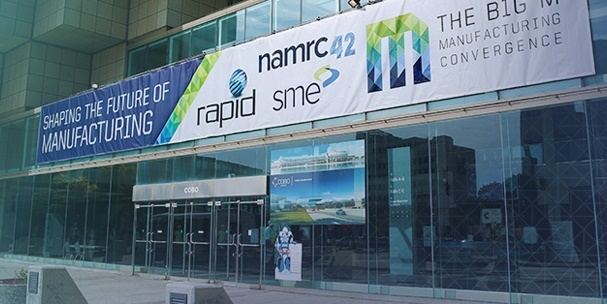 This year’s conference marks an important milestone for Roundup as we move into our new home at the Vancouver Convention Centre East. AME BC’s Mineral Exploration Roundup conference brings together prospectors, geoscientists, investors, suppliers and those interested in the mineral exploration industry every January in Vancouver. And over the past 31 years of the conference, Roundup’s value to the mineral exploration community has increased. Mineral exploration has always been rooted in prospecting and geoscientists. However, over time, declining commodity reserves, increasing competition for investment dollars and awareness of the need to build a social licence with Aboriginal Peoples and communities have all presented opportunities – and every year, Roundup is a venue to keep up to date on new best practices and solutions. Mineral Exploration Roundup 2015, with its theme “Intelligent Exploration”, will highlight our renowned Technical Sessions, Core Shack, Prospectors’ Tent and Map Tent, where you will learn about the latest discoveries and the strategies used to uncover mineral deposits. New this year are our best-practice Showcase Sessions, which will underscore the growing importance to our industry of Aboriginal engagement, corporate social responsibility, health and safety, land access and use, human resources and government relations. We also encourage you to take part in special events including our new Discovery Day, featuring public-interest talks relating to our industry and activities for the whole family. Finally, we invite you to enjoy our expanded trade show, various networking events and the always-popular short courses and field trips where you will build lasting contacts with colleagues and suppliers. Join us at AME BC’s Mineral Exploration Roundup 2015: Intelligent Exploration, from January 26 to 29, 2015, under the Canada Place sails at the Vancouver Convention Centre East. The Technical Program is organized under twelve thematic streams to facilitate the conference experience. Some of these streams are separate symposia, included with the CIM Convention package. Participants may choose depending on their roles and interests. Sessions vary between traditional presentations by subject experts to panel forums with leading personalities and key individuals to delve into the most relevant topics. All sessions will focus on a vision of excellence and best practices with ideas, opportunities, solutions and case studies showcasing ways to advance performance in all aspects of these general themes. Please return regularly as the technical program presenter line-up will be updated. The greatest challenges in managing mine waters arise at mines in extreme environments. Mines in extremely arid environments may require expensive systems to desalinate sea water and transport the water great distances to the mine. Mines in extremely wet settings may need expensive systems to treat excess process and contact water before discharging to sensitive receivers. Mines in extremely cold climates may face frozen conditions and the challenge of operating facilities where most of the water is ice for a good part of the year. Complex hydrogeological and geochemical issues are also common to the extremely wet, dry and cold climate settings. Mine Water Solutions in Extreme Environments 2015 is the second conference in the series focusing on EXTREMES. This innovative conference is focused on solutions to mine water issues in very challenging environments. The Atlantic Truck Show rolls back into Moncton, NB, June 5-6, 2015. This is Atlantic Canada’s largest and most-inclusive trucking show! Industry leaders will be on-site with impressive displays featuring the latest trucks and truck-related products on the market today. Manufacturers have raised the bar when it comes to fuel efficiency as well as the launch of newer engines and hybrid technology, all of which will be showcased at the 2015 edition of the Atlantic Truck Show. Visitors can expect gleaming displays of big rigs and industry-related products and services that will take over the entire Moncton Coliseum Complex and parking lot. Plus, the show will feature a 'Recruiting Here' program to match up skilled prospects with companies who are hiring, as well as a 'Ride & Drive' option where visitors can test drive brand new trucks! After considerable discussion with several major exhibitors and key industry leaders, the decision has been made to reschedule Expo Grands Travaux to take place in the spring of 2016. This change comes as a result of a number of industry factors indicating that heavy equipment buyers and sellers will be in a better position to support a show of this magnitude at that time. The 2012 edition of the show was a resounding success, with 15,632 qualified buyers in attendance, sold-out floor space, and more than 350 exhibitors reporting strong sales activity. Master Promotions Ltd.’s top priority is to continue to offer an industry event of the highest quality, and the show management team is confident that Expo Grands Travaux will be well positioned for continued success in 2016. Exciting new additions to the event are currently being developed, including one which will offer visitors a uniquely thrilling, educational and interactive experience never before seen at an indoor show in Canada. Watch for details in the coming weeks. This event welcomed more than 12,000 buyers in 2013! 2015 will represent the 14th edition for this biennial event – and it’s a big one. 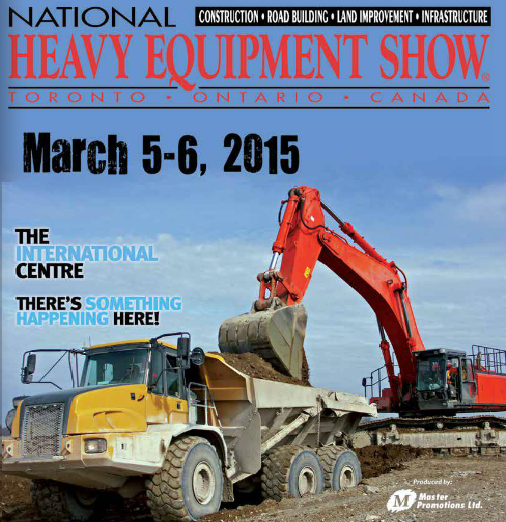 The National Heavy Equipment Show will take over Halls 1, 2 and 5 at Mississauga’s International Centre – with cutting-edge products, big machine displays, and demos. Mammoth space for a mammoth show! This show has evolved into a must-attend event, showcasing the leaders of the heavy equipment, road building, construction, snow removal, and aggregates sectors, as well as other related industries. If you are involved in any aspect of these industries, the National Heavy Equipment Show is the venue to jump-start your sales for 2015 and beyond! Canada North Resources Expo (CNRE) returns to take over the CN Centre in Prince George in 2015! With four acres of indoor and outdoor exhibits focusing on forestry, heavy construction and project infrastructure, this show features all the equipment needed to get the big jobs done. Wednesday, May 28th, between 3 p.m. and 7 p.m.
Northern Mines Expo recognizes the contribution that the mining industry has had in the lives of Northerners and the Expo would like to extend an offer to all Miners to come to the event and bring their families for a Complimentary Barbeque. Tickets are needed to confirm the amount so we will be able to know how many of you we can expect. So come on over and take look at the displays and don't forget to cheer on your fellow jack leg participants. Entrance to the Big Event is free of charge. Wednesday May 28th, 10 a.m. to 7 p.m.
Thursday May 29th, 9 a.m. to 4 p.m. This year the Miner's Barbecue is being held Wednesday, May 28th, between 3 p.m. and 7 p.m. or until the kitchen runs out. Please register by getting a free electronic ticket. The Eticket will provide access to the Miners Barbeque. The Eticket will be sent out starting May 15th right up to the date of the event. Complimentary tickets for the Miners Barbecue are restricted to employees who are connected to the mining sector. MILLIONS OF DOLLARS IN NEW EQUIPMENT ON DISPLAY, REGISTER TODAY ! Stay Tuned for Exploration Expose and Careers in Mining for Students, Companies are accepting Resumes.